For this Leif Erikson Day, another reminder that the frontiers of exploration are still being pushed outward! 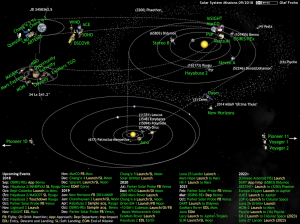 If you aren’t caught up, the Planetary Society keeps very good track of active missions and key upcoming dates. 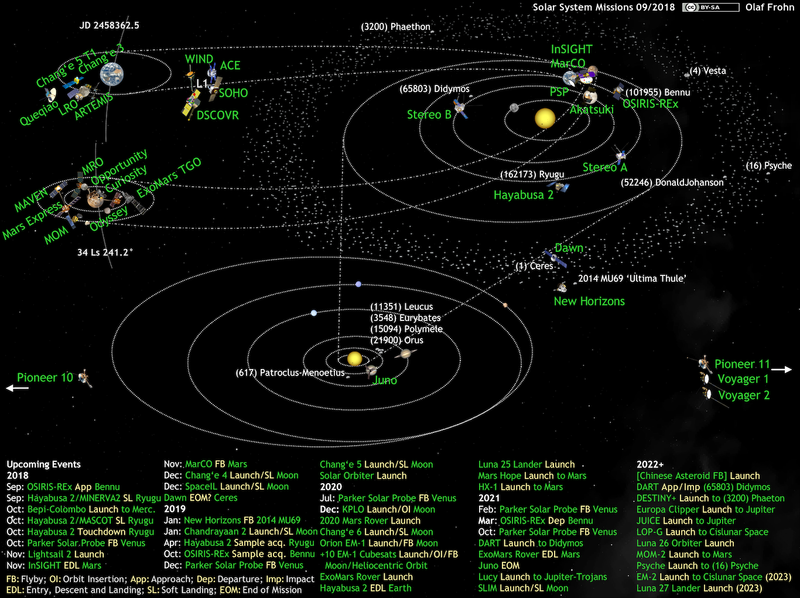 Wikipedia also has pages for almost all active space probes. One of the most exciting recent developments have been the number of space probes from China and India. Compared to NASA and European missions, they have tended to be smaller in scale but more frequent, though perhaps th epace is not as frenetic as a Second Space Race as some had forseen. ISRO even has a Mars mission – though oddly, the Mangalyaan Mars mission doesn’t seem to have the Electra radio relay found on most other Mars orbiters – the key part that lets the various Mars landers talk with Earth more easily. The BepiColombo mission to Mercury is set to launch this month! The death watch for the Opportunity Mars rover will end soon. The rover was caught in a sandstorm in June and hasn’t been heard from since. While it’s possible that NASA will hear back from it, it seems more likely that its power systems have totally failed. The Parker Solar Probe will reach its first close approach to the Sun on 6 November! InSight will land on Elysium Planitia on 26 November 2018, supported by two 6U MarCO communications relays, in another first for CubeSats! In December, OSIRIS-REx will reach its target, asteroid 101955 Bennu. Also two Moon missions, SpaceIL and Chang’e 4, are scheduled to launch by the end of the year. Then, at just about the crack of New Year’s Day 2019, NASA’s New Horizons (of Pluto fame) will fly by 486958 Ultima Thule, the farthest celestial body ever to be visited so far!